Here’s what’s up in the world of TV for Tuesday, May 4. All times are Eastern. New Girl (Fox, 9 p.m.)/The Mindy Project (Fox, 9:30 p.m.): The Tuesday-night comedies whose most recent seasons were defined (for better and worse) by big romantic plots each get one more episode out of those relationships. 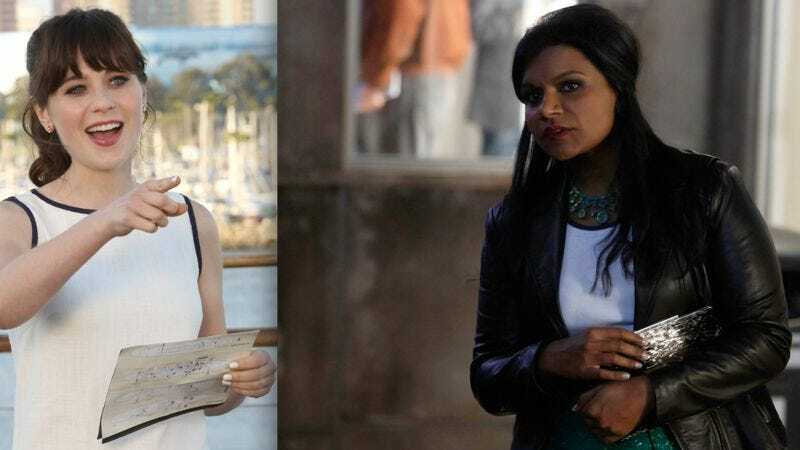 New Girl’s third season ends as it began—with a trip planned by Nick and Jess but necessitating the involvement of everyone else—while The Mindy Project heads into hiatus on the promise of a missed connection. Erik Adams packs the sunscreen, while Gwen Ihnat screens Mindy’s Craigslist replies for possible weirdos and/or killers. Glee (Fox, 8 p.m.): In what could be construed as a bid to star in NBC’s upcoming live production of Peter Pan, this Chris Colfer-penned Glee finds Kurt crowing and flying and probably making an offhand wisecrack about harnesses. The role of the crocodile ready to gnaw the episode’s hand off will be played by Brandon Nowalk. Trophy Wife (ABC, 9:30 p.m.): This week’s episode revisits the winning “Happy Bert Day” pairing of Kate and Jackie while simultaneously sending The Harrisons (Original Formula) on a college visit. Whither Bert? Brandon Nowalk hopes the youngest Harrison is revisiting his own winning comedy team-up with Meg. Fargo (FX, 10 p.m.): Neither Todd VanDerWerff nor Zack Handlen is named Adam Goldberg, and yet here they are, with a regular TV gig on Tuesday nights, America’s night of Adam Goldbergs. But really, they don’t want to review TV shows—they wanna dance! The first season of IFC’s Maron wasn’t a huge hit with the TV Club readership, but we still want to give Marc Maron a chance, because we still think he’s a good guy and a great comedian. That’s why Phil Dyess-Nugent’s giving you the lowdown on the first few episodes of Maron’s second season. Now, as the man says, lock the gates! Alaskan Bush People (Discovery, 10 p.m.): Cable’s frantic race to complete a filmed ethnographic record of the entire human race—covering the spectrum from people buying other people’s garbage to people selling their own garbage—hits newly specific, non-garbage-buying heights with this profile of a family living off the grid in Alaska. Apparently, that’s all you need to do to qualify as your own mini-civilization these days. Freakshow/Small Town Security (AMC, 10/11 p.m.): AMC’s “Subsidizing The Mad Men Wardrobe And Walking Dead Makeup Budget” Block changes hands. Small Town Security begins its third season with a very Small Town Security episode title: “Someone’s Got The Meatball.” What’s On Tonight doubts that “someone” will be happy once they realize they have said meatball. Totally Tracked Down (Reelz, 11 p.m.): This Canadian acquisition—a “way are they now?” program in which host Marshall Jay Kaplan finds his celebrity quarries with the use of the Hollywood phone tree—first aired in the Great White North in 2010. So Canada’s known where these people are for more than three years and hasn’t bothered to tell us? Escape From Alcatraz (Sundance, 7:30 p.m.): A dramatization of what may be the only successful attempt to breakout from America’s most infamous prison—naturally, it’s a task only 1970s Clint Eastwood could complete. The Children’s Hour (TCM, 8 p.m.): In a story about a prison of another sort, Audrey Hepburn and Shirley MacLaine find themselves trapped in a web of deceit and life-ruining rumor in an adaptation of the play by Lillian Hellman. MLB Baseball: White Sox at Cubs (WGN America, 8 p.m.): Game Two of what we now call The Crosstown Cup, even though “Red Line Series” is a more stylish, regionally specific nickname. And if we sacrifice sports nicknames based on regional public transit, what’s next to go? Peanuts? Cracker Jack? Not caring if you ever go back to the ballpark? A pair of recent PBS standouts get DVD releases: Let Neil Shubin bring out Your Inner Fish whenever you want (provided you have a DVD player), or watch Simon Schama condense a considerably shorter period of human history into The Story Of The Jews. Bates Motel: As Todd VanDerWerff tells it, Vera Farmiga singlehandedly turned this show around in the second season. Who knew Norma Bates had such powers of influence?